At last night’s Supercross season opener in Anaheim, California, Yahama rider Weston Peick was taken out by Vince Friese and responded... poorly. Use your words, kids. Maybe it was because of Angels Stadium’s proximity to the Honda Center where the Anaheim Ducks hockey team plays, or maybe it was just first night tensions running high, but the 450 class races were exceptionally brutal. During the heat races, Friese ran Peick into the blocks that line the track, which knocked him down. Then, in the semi, Friese made another move on the inside of Peick and the two collided. 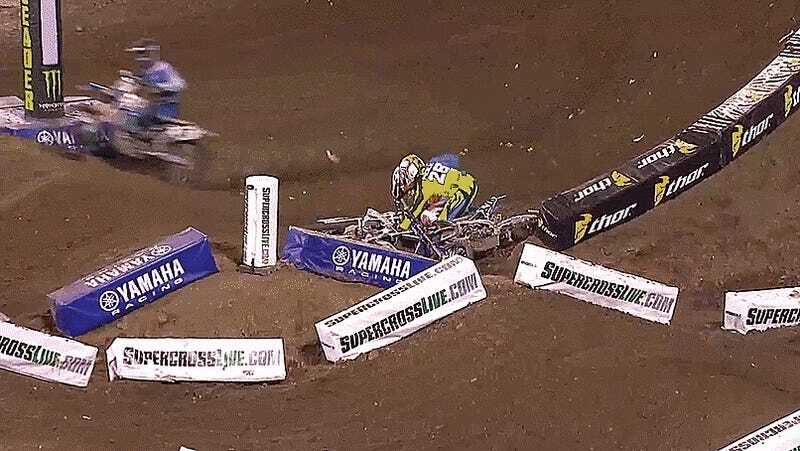 Peick popped up and started throwing punches at Friese’s helmet, then shoved him into the blocks. Peick was disqualified. Because hitting people is rude. I’m pretty unfamiliar with Friese, but the guys I know close to Supercross say he’s a bully and has absolutely had it coming. More than a few fans seem to agree. As for Peick, I met him last year too, and let’s just say neither of these guys seem like wonderful humans. We’ll have more next week in terms of a race recap, news on Stewart, thoughts on Dungey and Friese, as well as looking ahead, so stay tuned. In the meantime, use your words. Punching a bully on live television and in front of thousands of people is really dumb, even if it makes for amazing television and YouTube afterward.